We're honored to have been invited to participate in a fascinating series that's recently hit the blogosphere. The Writing Process Blog Tour is a way for bloggers to give friends and readers a glimpse into their behind-the-scenes creative process and current projects. 1. Introduce you to the blogger who invited us to participate. 2. Answer 3 easy (well, sort of easy) questions. 3. Tag a couple of our favorite bloggers whom we'd love to have participate too. 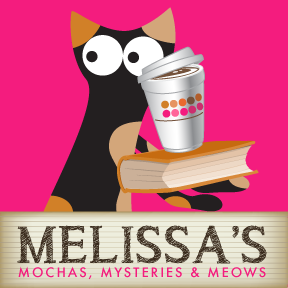 We're especially thrilled to have been invited by Melissa, of Melissa's Mochas, Mysteries & Meows. 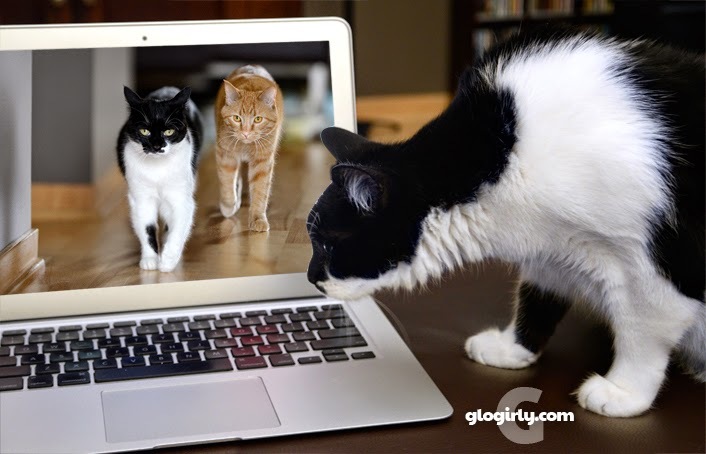 Her charming and informative blog showcases her two greatest loves - books and cats. We first met Melissa when she came to us for a blog makeover. At the time she was focusing on book reviews, but we could tell her love for all things feline was just dying to make it to the pages of her blog. And that it did. We think you'll love Melissa and and Truffles the sweet tortie, just as much as we do. WAFFLES: I'M working on finding my next chicken drummie. KATIE: Waffles, no one cares about your chicken drumstick. They want to know what you, me and Glogirly are working on. You know, for our BLOG??? WAFFLES: Oh yeah. Well I'm working on posing for pictures with cool stuff we're going to give away. Even though I'm orange, Glogirly says I'm a regular Vanna White. KATIE: My focus continues to be time management and supervision. But what's GLOGIRLY working on? 1. Cool products & giveaways. She's partnering with a number of great brands and artisans to bring you some cool, new stuff we hope you LOVE! 2. Looking for the next BIG (funny) thing. We've all been loving our Saturday feature called TV Trips where we create parodies of classic TV shows. We're still working our way though a list of favorite shows, but it's not going to last forever! Photos, photos, photos. Glogirly takes a LOT of photos... almost everyday. Some for fun and some for brands. Waffles is the primary product model. Katie steps in for the beauty shots. Lately Glogirly's been working with a number of DOG bloggers (gasp!) on design projects like logos, headers, media kits & book covers. She's an equal opportunity designer. For a few months now Glogirly has been doing custom photography for brands and even a cool new writing project for Sleepypod's Pet Travel Experts. We even have Sleepypod's REAL crash test dogs staying with us here in the Townhouse! 6. Helping our shelter friends. 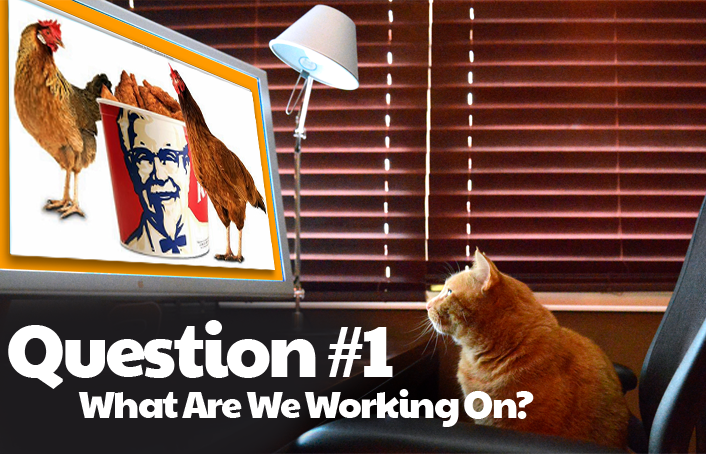 She's always on the lookout for contests and projects that will provide us an opportunity to help shelter cats. In particular, the shelter cats of Minnesota's Feline Rescue. Over the past few months we've been extremely fortunate to have won some contests that have made for some very nice food and cash donations. We're waiting on results of a couple right now - The Petties and the mike's® HARDER can contest. Our blog started out as a hobby way back when waffles was just a tasty breakfast food. Glogirly thought blogging would be a fun way to learn about social media and practice her design and photography skills. The only problem was that she didn't know what to write for that very first blog post. Gloman told her she should have ME introduce the blog. And I've been the *voice* ever since. That's what it's all about for us. Both Glogirly and I share the same sense of humor. Sarcastic and dry...not that sophomoric *Waffles* kind of humor. Nothing brings us more joy than making people grin from ear to ear. And what better way to spread joy than through the love of cats. Glogirly says our blog has helped her to walk in our paw steps and peek inside our hearts and minds. Both Waffles and I have a very special bond with her and she believes our blog has helped strengthen that bond. a.k.a. What's the Method to our Madness? Glogirly is VERY visual. Nearly all of the inspiration for our blog posts begin with photos. Whether we're writing about a brand and hosting a giveaway, creating a TV show parody or just having fun... for us, it all starts with pictures. As Glogirly goes through the most recent images she's taken, she'll look at the best ones and imagine what me or Waffles might be thinking or saying to each other. 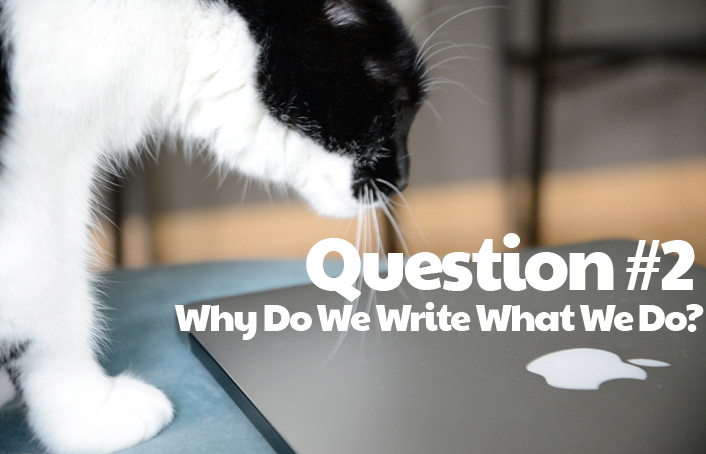 Most of our blog posts are written the night before they publish. So in addition to photos, a lot of inspiration comes from what's happened during the day. An abandoned chicken drumstick on the kitchen counter, a standoff at the Sleepypod... sometimes we even get ideas from comments friends leave us on Facebook! Once she has a rough idea for a story line, she'll upload the photos to a new blog post draft and start writing the dialogue between me and Waffles. Sometimes it takes a few minutes, sometimes a few hours. Sometimes she'll have to go back to the original photos to find just the right one for a funny line. And sometimes there's a photo that's so hilarious on it's own she creates the dialogue around it. There's lots of reading out loud, back and forth editing, smiling and even giggling. Oh, and singing too. When she rewrites the lyrics to a TV Theme song, she's got to sing it over and over and OVER. Did you see The Beverly Hillkitties??? Join the Pets Can Play Product Review Group! This is BIG. One of our FAVORITE companies has an amazing opportunity for our readers and other bloggers! 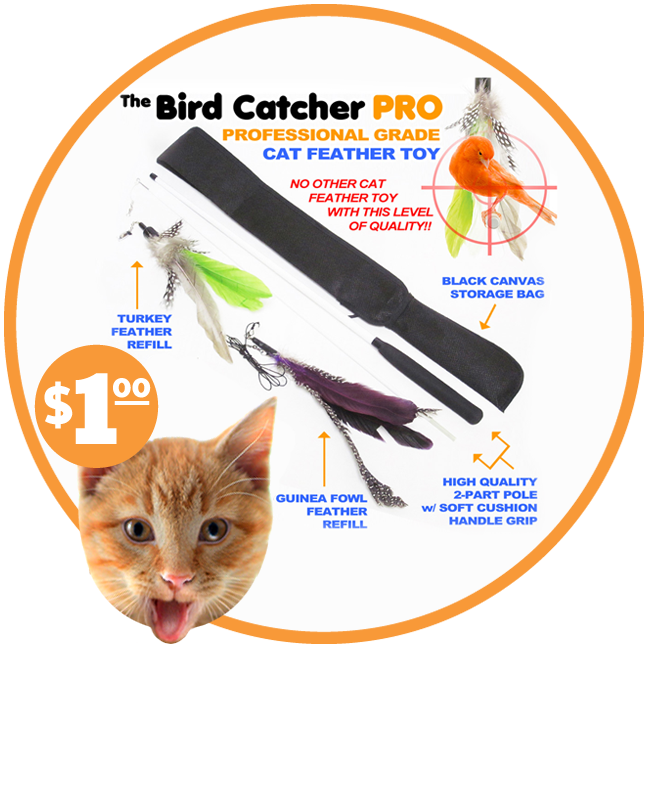 For JUST $1, you'll get their fabulous Bird Catcher Pro wand toy with all of the accessories you see in the photo, valued at $29.95. We've featured the Bird Catcher Pro here on GLOGIRLY a number of times and we LOVE it. Super high quality and incredibly realistic "bird" action! All you have to do is write an honest review that will appear on Amazon.com. Pets Can Play wants to get the word out on their products through reviews provided by people who actually own them and have used them. In addition, there are several new products that will launch in the coming months and this is your chance to get them at impossibly low prices you'll not find anywhere else. Just click below for all the details. Space is limited... so you better hop to it! *The Pets Can Play Product Review Group Is Only Open to USA Residents Only. Our Sincere Apologies. I hope Waffles gets his most heartfelt wish. You guys are all very busy right now! Waffles, I wanna know more bout dis chikken. Very cool to see your writing process. I was wondering how long the TV thing would last. You could always do some modern shows too? I do like those though. I would have never imagined you write your posts the day before they go live. I've been doing the same thing lately as well. Great behind the scenes look at the blog - I especially enjoyed looking back at the pre Waffles first post. So THAT's how you guys do it. ;) Thanks for sharing. I would love to know what kind of camera/lens combo you're using to take those awesome pictures of Katie and Waffles? Love. This. Post. I just knew I made the right choice nominating you, and thank you so much for the sweet words about our blog. We love you!!! Except for the fact that you have talent and start with the photos, our writing styles are similar. Sometimes TW will take a photo and write around it, but usually the writing comes first and then she takes photos out of the archives to illustrate it. Since we already did this, we’re wondering if there’s some sort of blog hop to hook up too so we can read others. BTW, TW can’t believe that you don’t write your dialog weeks in advance. One more thing, whenever TW reads an upcoming post to Pop, I always walk up to the chair and bite her. Great blog post. Loved learning more about you. Wonderful peek behind the curtains of Waffles and Katie! That's interesting. We think you have the funniest bloggy ever. The dialog between Katie and Waffles is purrfect. Good job. Great to hear your writing process! All the FAB stuff your working on too! Katie I really enjoyed this post..I also enjoy reading your first post..I bet it was scary to put that first one out there..and just look how far you have come from that day..OK..I got to tell you the picture of Waffles staring at the KFC is hilarious..So keep doing what you do..all three of you..because you are just so good at it..Hugs..and thanks for the chance to be a product reviewer..I already joined and placed my order..We are going to have such fun doing this! T'all are always rockin' the whole blogging world! What a fun post! 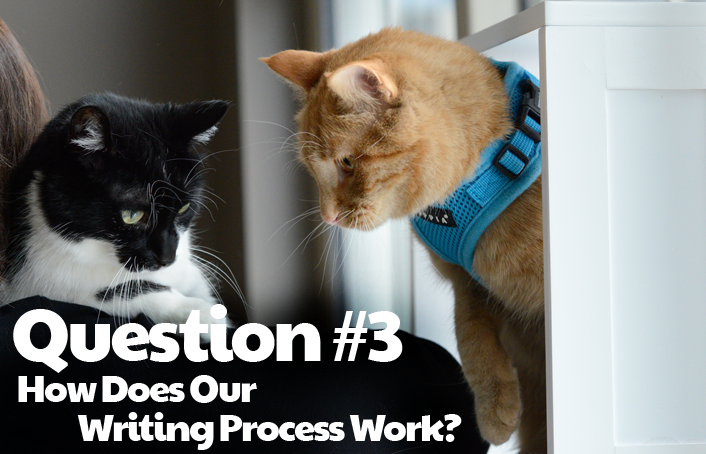 We're really enjoying hearing about everyone else's writing processes. Great post Katie. I can see that you have always been the beauty and of course, brains behind the blog. I know, I know...Glorgirly helps...but 'you' are why there 'is' a blog; na' mean??? Oh yeah, and Waffles, he is adding valued now, I can see that...well, some...sort of...ok,ok...he has a cute pink nose! oh boy oh boy oh boy oh boy...Mommy, the pressure is ON! Better get crackin'. We are amazed that Glogirly does her post the same day...we thought only our demented Mommy was so...um..."last minute". And Waffles? The heck with the drummie...go for the thunderthigh! What a gweat posty. Weez suwe hope we can get in on dat toy weview. Weez wuld luv dat. It sed it wuz only opento da first 125, so weez suwe hope weez one of them. I love getting the inside story on how a bloggers mind works! We loved getting the behind the scenes peek! And seriouslies? You tagged us?? Glogirly primarily shoots with a Nikon D600 and a 24-85mm zoom lens. She's also got a new 200mm macro lens she's been playing around with. And every once in awhile, Gloman will loan her one of his lenses. ...though he says that's an awful lot like loaning her his toothbrush or underwear. Fantastic! Thanks so much for sharing all! Love who you nominated too! Can't wait to come visit you blog, just wish Mom had more free time so we could come every day! College scholarship essays are a big component of your applications, but can be a major headache. While writing don’t forget about open your life goal and its meaning to you. Click thesis writing service to find more!